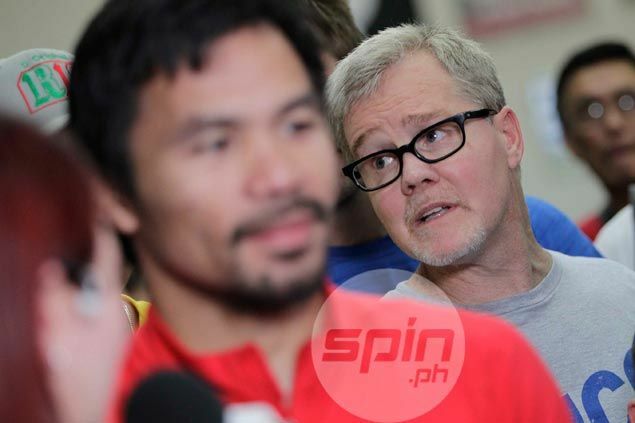 MANNY Pacquiao remains quick on the offensive, emphasizing he hasn’t made a decision yet whether or not the legendary Freddie Roach will still be on his corner for his world welterweight title fight against Lucas Matthysse. The 39-year-old Philippine pride said he hopes to come up with an answer within the week, and his long-time trainer will be the first one to know about it. “I will make a final decision within the week. When that decision is made, Freddie will be the first one to be informed, and then I will advise the media,” Pacquiao posted on his Instagram account early Monday morning. The statement comes in the heels of Roach’s claim that he was hurt not being informed personally by Pacquiao about being dropped from the eight-division champion's corner for his next fight against Matthyse, the reigning World Boxing Association welterweight champion, on July 15 in Kuala Lumpur, Malaysia. The 58-year-old trainer made the pronouncement after admitting he hasn’t personally heard from the boxing legend since they worked together last year in a 12-round unanimous decision loss to Australian Jeff Horn to yield Pacquiao’s welterweight version of the World Boxing Organization. It didn’t make things better when a recent press release on Pacquiao’s upcoming duel with Matthysse never mentioned Roach, and instead said the Philippine senator will be joined by trainers Restituto ‘Buboy’ Fernandez and Raides ‘Nonoy’ Neri. But Pacquiao, the only fighter to win eight world titles in as many weight divisions, said he hasn’t decided yet on whether to part with Roach for his next fight or not. The drama surrounding the break-up of one of boxing’s most successful partnerships comes on the same week Pacquiao and Matthysse begin the promotional tour of their 12-round fight, the biggest to be held in the Malaysian capital since the late great Muhammad Ali decisioned Joe Bugner for the world heavyweight championship of the world in June 1975. Matthysse will be accompanied by promoter Oscar Dela Hoya of Golden Boy Promotions when he arrives in the country on Wednesday for the start of the two-city press tour that will also take both fighters to Kuala Lumpur on Friday.